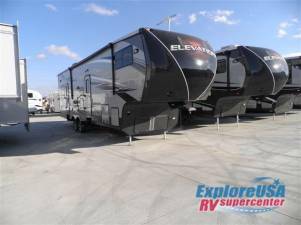 Double Slide Elevation Toy Hauler Fifth Wheel, Rear Sofas, Dinette Slide, Pantry, Refrigerator, 3-Burner Range, Dbl. Kitchen Sink, 2-Bar Stools, Closet, Entertainment, Step Up To Bed/Bath, Dbl. Wardrobes/Closet Slide, Nightstand, Queen Slide, Overhead Cabinets Throughout & Much More.